Investment will create valuable partnerships to spur greater innovation in payments. Wally Mlynarski is Elavon’s chief product officer. Elavon, a global payments provider and subsidiary of U.S. Bancorp (NYSE: USB), announced a new and significant, three-year financial commitment at the Georgia Institute of Technology to further accelerate innovation across financial and payments technologies (FinTech). The Advanced Technology Development Center (ATDC) at Georgia Tech is Georgia’s technology incubator. It focuses on building and growing FinTech companies in the state of Georgia. Elavon’s financial sponsorship will allow for further growth and startup support for entrepreneurs in the program. As part of the sponsorship, Elavon executives will mentor program participants on topics such as software and applications integration as well as consultation on effective go-to-market strategies. As the FinTech space continues to evolve, partnerships with incumbents have become more important for an early-stage company’s customer acquisition and business model development. In addition to receiving the benefits of being an ATDC program participant, startups in the incubator’s FinTech Program are integrated into Georgia’s FinTech ecosystem. This statewide ecosystem consists of strong public-private partnerships dedicated to the continued success of Georgia FinTech companies. ATDC FinTech provides access to industry, investors, and Georgia Tech’s resources to help these startups flourish as well as coordinating support from the Technology Association of Georgia, FinTech Atlanta, and the Metro Atlanta Chamber. The ATDC FinTech program currently hosts 35 early-stage FinTech startups. Since the program’s inception in 2015, ATDC FinTech startups and recent graduates have raised more than $65 million in angel and institutional venture capital. Elavon is wholly owned by U.S. Bank, the fifth-largest bank in the United States, and provides end-to-end payment processing solutions and services to more than 1.3 million customers in the United States, Europe, Canada, Mexico, and Puerto Rico. As the leading provider for airlines and a top five provider in hospitality, healthcare, retail, and public sector/education, Elavon’s innovative payment solutions are designed to solve pain points for businesses from small to enterprise-sized. The Georgia Institute of Technology is one of the world’s premier research universities. 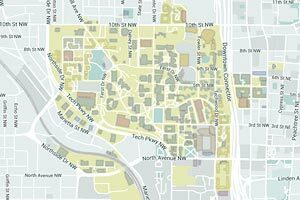 Georgia Tech is a national and international leader in scientific and technological research and education and is the nation’s leading producer of engineers as well as a leading producer of female and minority engineering Ph.D. graduates. Ranked among the top public universities by U.S. News & World Report, the Institute enrolls more than 25,000 undergraduate and graduate students in fields ranging from engineering, computing, and sciences, to business, design, and liberal arts. For additional information, visit gatech.edu. The Advanced Technology Development Center (ATDC), a program of the Georgia Institute of Technology, is the state of Georgia’s technology startup incubator. Founded in 1980 by the Georgia General Assembly which funds it each year, ATDC’s mission is to work with entrepreneurs in Georgia to help them learn, launch, scale, and succeed in the creation of viable, disruptive technology companies. Since its founding, ATDC has grown to become one of the longest running and most successful university-affiliated incubators in the United States, with its graduate startup companies raising $3 billion in investment financing and generating more than $12 billion in revenue in the state of Georgia. To learn more, visit atdc.org. The Georgia Institute of Technology’s Economic Development Lab (EDL) hosted a group of 12 professionals from Peru’s Universidad del Pacifico who sought to get a better understanding of entrepreneurial ecosystems and best practices for innovation development and support. The group represents the university’s Emprende UP, which serves as its center for entrepreneurship and innovation. Emprende UP runs pre-incubation, incubation, and acceleration programs at the Universidad del Pacifico, a small, private Jesuit school and highly ranked in Peru and across Latin America. “We chose Georgia Tech because the Tech model in entrepreneurship and innovation is similar to what we are doing in Peru,” said Javier Salinas, Emprende UP’s director. “At the end of our three days here, we recognized that we’re on the right track, but we can improve and refine our services for the Peruvian innovation ecosystem. EDL, a program of Tech’s economic development arm, the Enterprise Innovation Institute, helps communities and organizations apply innovative ideas to economic development in business incubation and commercialization, strategic planning, and economic sustainability. 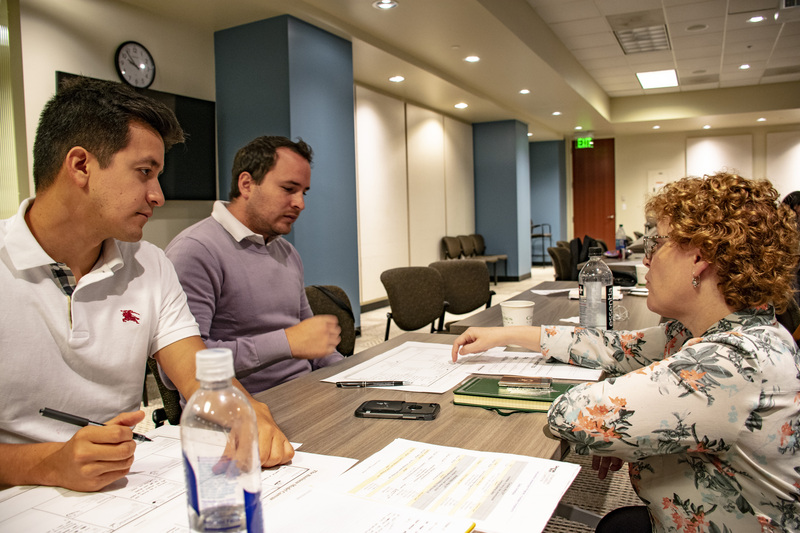 “The objective of this three-day immersion program at Tech was for the Emprende UP team to experience and learn from the innovation and entrepreneurship ecosystems here at the Institute and across Atlanta,” said Mónica Novoa, an EDL project manager. As part of that learning process, the Emprende UP team toured Georgia Tech’s Advanced Technology Development Center (ATDC), which is the state’s technology incubator, and met with some of its startups in the financial technology (FinTech) sector. The FinTech space was of particular interest because Emprende UP has spent the past 18 months developing an ecosystem around it and working with Peru’s banking regulators, leading financial institutions and international technology firms towards that initiative, Salinas said. Beyond FinTech, the team focused on learning about other components that comprise successful innovation ecosystems, such as closer alignment with academics. They also saw how corporations seek to be near universities and tap into those schools’ research and innovation expertise. In the past five years, more than 20 large corporations, including Delta Air Lines, AT&T, and Anthem, have opened corporate innovation centers in and around Technology Square to access the talents and technologies developed at Georgia Tech. 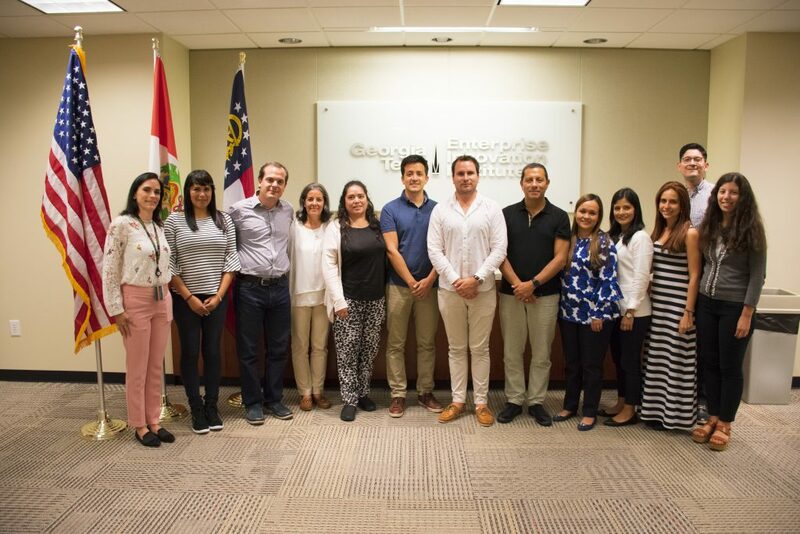 EDL, which has had projects in 151 of Georgia’s 159 counties and more than six dozen initiatives in 9 countries, will be going to Peru in August as a follow up in continuing its ecosystem development work with Emprende UP.